Information presented here is based upon postings to the Letterpress E-mail Discussion List, the 2007 Journal of the Printing Historical Society article by Erik Desmyter and Bob Oldham, my own searches on the Internet, and e-mail messages from owners and observers of Liberty platen presses. LetPress messages are referenced by author and date. 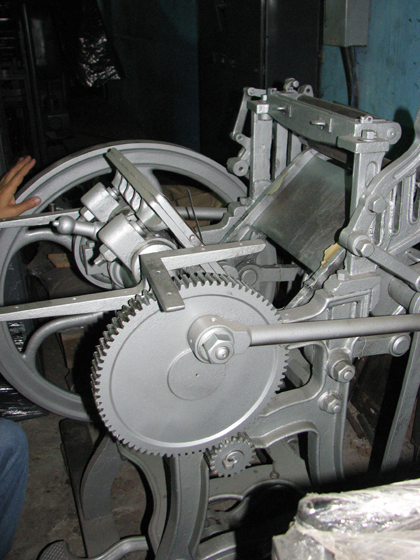 Manufacturing dates are estimated from the serial number, using an average of 385 presses built per year from 1860 to 1886, and 273/year afterward. 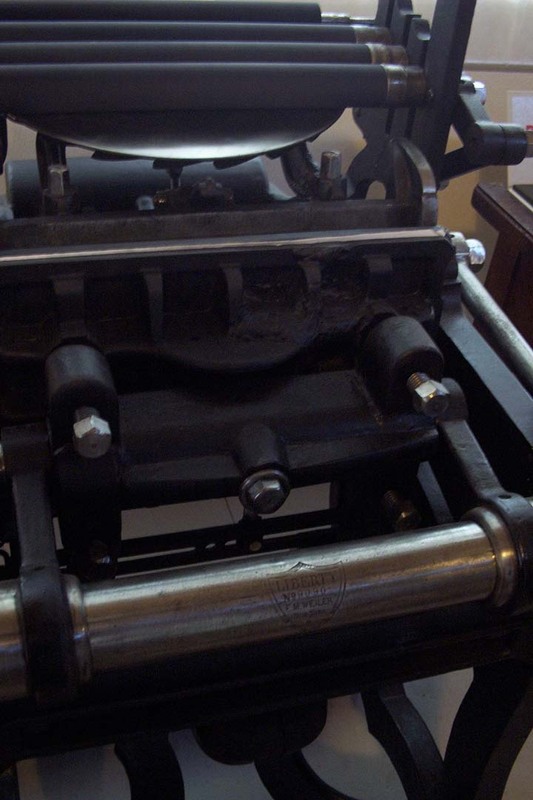 The first group of presses has an oval plate mounted on the counter-weight that lists only Degener as the manufacturer, and only the original patent. The serial number is not surrounded by a shield. it was in South Bend, Indiana, before 2018. There is a significant gap in serial numbers, so we don't know when the manufacturer's name switched to Degener & Weiler. At last report, the following press was dismantled in storage and unavailable for examination. According to a 1985 exhibition catalog the press was made by Degener and Weiler, New York. The next group of presses have a shield on the crank shaft listing the manufacturer Degener & Weiler of New York and London. All three Degener patents and the extension are included in the shield. These were probably manufactured between 1874 and 1877. Weiler bought out the Degener family's interest in the company during 1877. The following press lists the manufacturer as F. M. Weiler of New York and London. The original patent and its extension are included, but the 1870 and 1872 patents are not listed. The following presses list the manufacturer as F. M. Weiler of New York. (London was dropped.) All three patents and the extension are included. An 1887 ad notes the press is available "with or without throw-off, purchaser's choice." 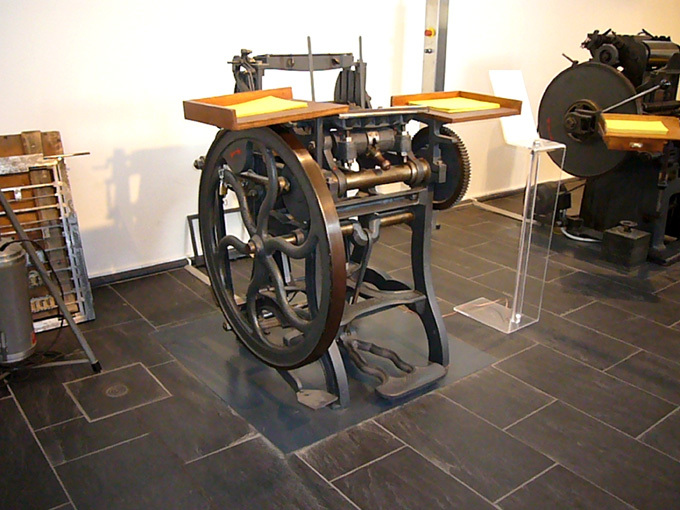 Earliest known press with a throw-off, patented in 1886. The press with serial number 10226 has a plaque listing 9 patents dated Nov 1885 to Aug 1887. Presses that included the innovations represented by these patents (including noiseless gripper motion, triple combination fountain, and new throw-off) were marketed as "New Style Noiseless" Liberty presses. The throw-off came on all presses. The following presses show the manufacturer as F. M. Weiler of New York and Berlin. No patents or extensions are listed. Serial numbers and descriptions have not been reported for this final group. this video may be related. Lendinara, Italy J. H. Rust & Co. If you come across a Liberty press or can provide further information on the ones listed here, please let me know. Here are some tips on how to identify a Liberty press.